When John Taylor starts remembering the years leading up to the financial crisis, his fury wells up all over again. As president of the nonprofit National Community Reinvestment Coalition, he warned Congress about the predatory and fraudulent lending that was fueling a housing bubble as early as 2000. Lawmakers told the Federal Reserve to write rules that would have put a stop to the worst practices. But the crash came first. "Thinking about it now, I can feel myself being angry about it," says Taylor, in a soft accent left over from his upbringing in the housing projects of Boston. "Because we fought when we saw these things happening. We brought it to the attention of both Democrats and Republicans. In the end, it took the nation's economy having to collapse before they felt the need to do something." 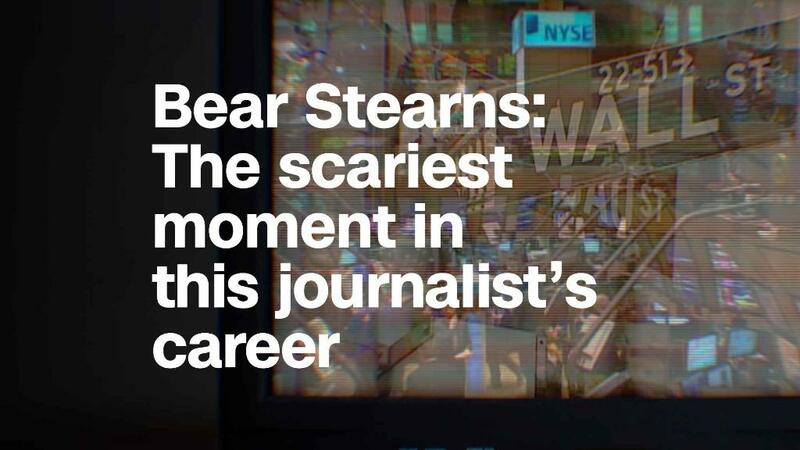 The crisis unofficially began a decade ago today, with JPMorgan's shocking deal to rescue Bear Stearns for $2 a share after the investment bank suffered deep losses tied to its mortgage investments. Bear was the first major investment bank to fail, but it would not be the last. Now, with a buoyant economy finally starting to lift some of the United States' most depressed pockets, CNNMoney is taking a look back at the 10 years following the financial meltdown that stretched around the globe — and signs that something similar might again be on the horizon, as Congress and regulators begin to loosen some of the rules they put in place to fix and prevent the problems. "We're sitting here, 10 years later, with a short-term memory that doesn't seem to recall how we got into that mess," Taylor says. "We got into that mess because of the lack of regulation, and now we're talking about making banks less accountable. It makes no sense whatsoever." Of course, America has come a long way since the government had to step in to save the banking system from going under. Corporate profits are at record highs, the unemployment rate is at a 17-year low and the stock market has quadrupled in value since its Recession-era nadir in 2009. But this is still a changed country. 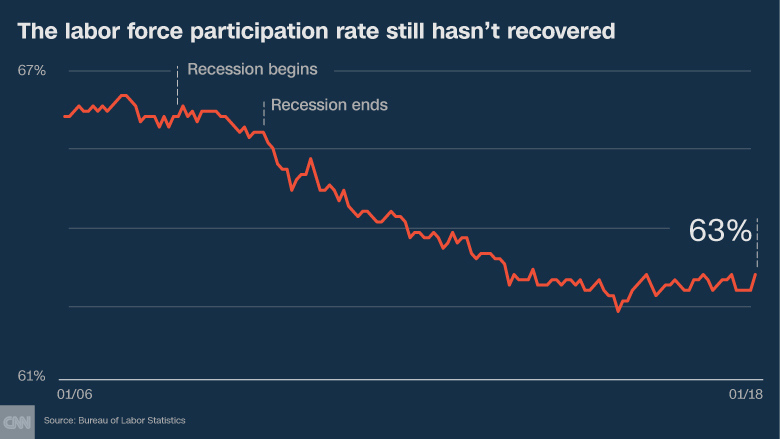 By many metrics, and for millions of Americans, the recovery has yet to arrive. Take the homeownership rate, for example: Only in 2017 did it stop its long downward slide, after private equity investors bought hundreds of thousands of foreclosed homes and rented them back to their former owners, many of whom saw their credit so badly damaged that they can never buy again. Male workforce participation is still nearly as low as it's ever been, since blue-collar professions were particularly hard hit and haven't totally bounced back. The recovery has deepened the divide in other ways: Geographically, with big tech hubs and cities rich with natural resources booming and the Rust Belt and foreclosure capitals falling behind. And by income, with most gains going to households in the top 10% of the wage scale. 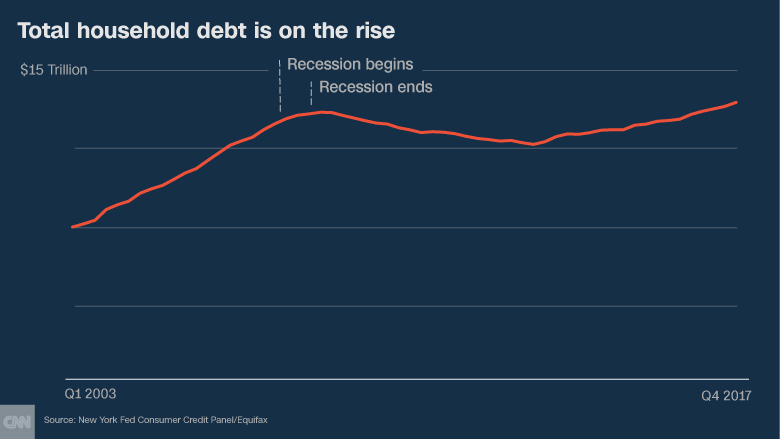 Median household net worth remains below where it stood in 1998, according to the Federal Reserve, even as households take on more debt than ever before. There's also a shortage of affordable housing, a legacy of the drought in both mortgage and construction lending that lasted long after the worst days of the recession had passed. Memories of those difficult days seem to have faded from the public consciousness, as have the lessons we learned on how we got there in the first place. Congress tried to answer this question when it established the Financial Crisis Inquiry Commission, and its 2011 autopsy of the meltdown remains excellent reading today. Its fundamental conclusion: The financial crisis was not like a freak weather event, as some bankers and regulators had claimed. Rather, it was man-made, predictable and entirely avoidable. If only lawmakers hadn't knocked out legal guardrails in the 1990s that had kept banks small and relatively uncomplicated. If only bank CEOs had thought more critically about the complex securities they had created and traded with abandon. If only the Federal Reserve had acted to stop the flow of toxic mortgages that would rot through the core of the nation's largest financial institutions — they could have saved the global economy from disaster, the commission found. Even as the commission's report was being drafted, however, the next chapter of the recession was unfolding. In 2009, President Obama pushed through a stimulus package worth $787 billion in an effort to save jobs, and launched home mortgage modification programs to help those at risk of foreclosure. A year later, the Dodd-Frank Wall Street Reform and Consumer Protection Act of 2010 established new oversight bodies to coordinate the alphabet soup of regulators that had avoided responsibility by acting in silos. It also created the Consumer Financial Protection Bureau, which was explicitly charged with monitoring malfeasance by lenders. 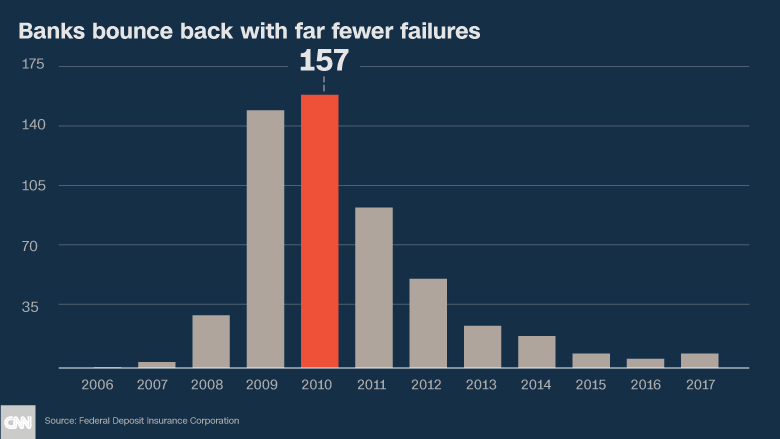 It instructed financial regulators to draft new rules for derivatives, credit bureaus, mortgage appraisals, executive compensation, corporate governance and other factors that played a role in the economy's implosion. While most agree that the financial system is safer now than it was before the crisis, there's been abundant criticism of the adequacy of the response. Many argue that bailouts for homeowners should have been much more generous, in order to avoid more foreclosures and better stabilize neighborhoods, and that banks should have been pushed harder to lend to qualified borrowers once new safeguards were put in place. Others faulted Obama for not punishing the executives at fault for reckless lending. Although their firms — and thus shareholders — have paid out hundreds of billions of dollars in fines, none of the people running these investment banks and mortgage lenders went to jail. The Financial Crisis Inquiry Commission itself made eleven criminal referrals to the Department of Justice, and none were prosecuted. The commission's chairman Phil Angelides says the lack of action sent a message to Wall Street that consequences for individuals would be minimal. "I believe it was a seminal failure of the Obama administration not to hold accountable the people responsible for the wrongdoing," Angelides says. "If someone robbed a 7-Eleven of $1,000, and were able to settle up by having someone else pay $50, would they do it again? Of course they would." Banks have spent billions of dollars complying with Dodd-Frank, even while fighting the rules as they were written, contributing to long delays in implementation. As of mid-2016, 20% of the mandated rules hadn't been proposed at all. The Treasury's independent Office of Financial Research, which Dodd-Frank established to serve as an early warning system for impending crises, has been dramatically scaled back. More broadly, Anat Admati, a professor at Stanford's Graduate School of Business, argues that reformers missed their chance to increase transparency in the financial system and decrease the industry's dependence on debt, which could pose a risk as interest rates start to rise. "We haven't had a major crisis and a bailout," says Admati. "But in terms of being prone to one, I'm disappointed that relatively little or not enough really changed." Now, after years of attempts, Republicans are poised to pass the most significant rollback of Dodd-Frank regulations since the bill was enacted, with the help of 16 DemocratIc senators who this week voted to exempt banks with less than $250 billion in assets from enhanced supervision. The bill also frees most banks from having to report lending data used to police for discrimination and weakens mortgage underwriting standards, among a host of other provisions. Meanwhile, President Trump's picks to head federal agencies overseeing the banks have either worked for the industry, like Securities and Exchange Commission chairman Jay Clayton, or have been harsh critics of the agency they've been put in charge of, like the CFPB's acting director Mick Mulvaney. They have slowed or halted enforcement actions and rule making and imposed hiring freezes, limiting their ability to pursue fraud. Add to all of this an exuberant market and it again brings big risks, from rising corporate debt to cyber threats that can cripple whole companies in an instant. In combination with weaker tools to address financial failures when they occur, Columbia Law professor Kathryn Judge worries that these industry-friendly regulators again won't take action when they need to. "There's been a shift from safety to growth," Judge says. "But if you want to have a growth-oriented system, then you have to accept that there's going to be fragility. How are we going to deal with that fragility when it becomes manifest?" 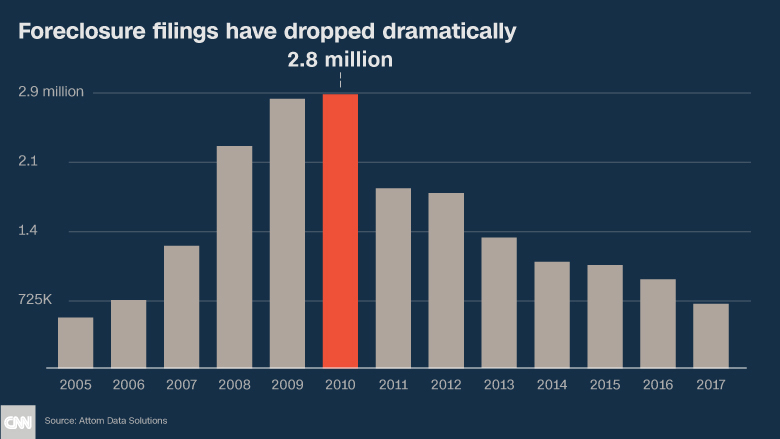 A Decade Later: It's been 10 years since the financial crisis rocked America's economy. 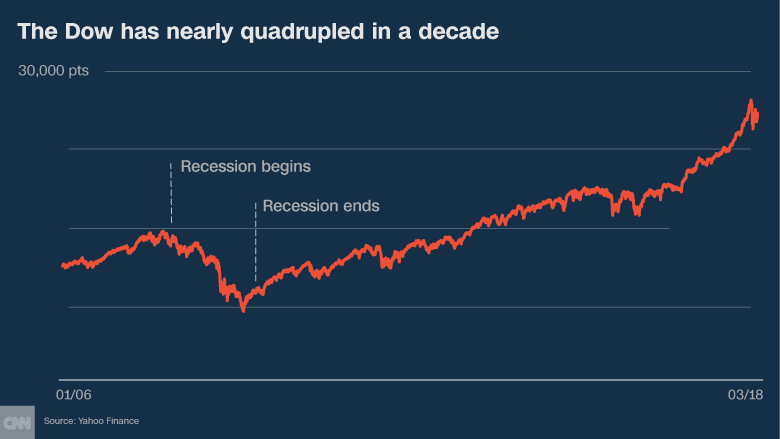 In a special yearlong series, CNNMoney will examine the causes of the crisis, how the country is still feeling its effects, and the lessons we have — and have not — learned. Correction: An earlier version of this story incorrectly identified Anat Admati, who is a professor at Stanford's Graduate School of Business.